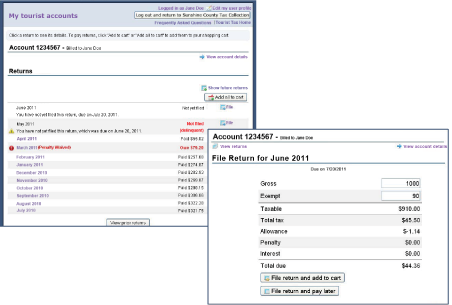 TouristExpress™ allows taxpayers to file returns and make payments online through our secure PaymentExpress® website. Access to Tourist Development Tax accounts from the website is controlled by the client via an approval workflow, to ensure the security of confidential tourist development tax information. TouristExpress saves the labor of filing returns manually, and particularly of dealing with resulting errors.